After reading Fredric Wertham's article, "The Comics...Very Funny! ", in The Saturday Review (May 29, 1948), the representative for Kamloops raised his concerns in the Canadian House of Comics over the connection between juvenile delinquency and crime comics in Canada. 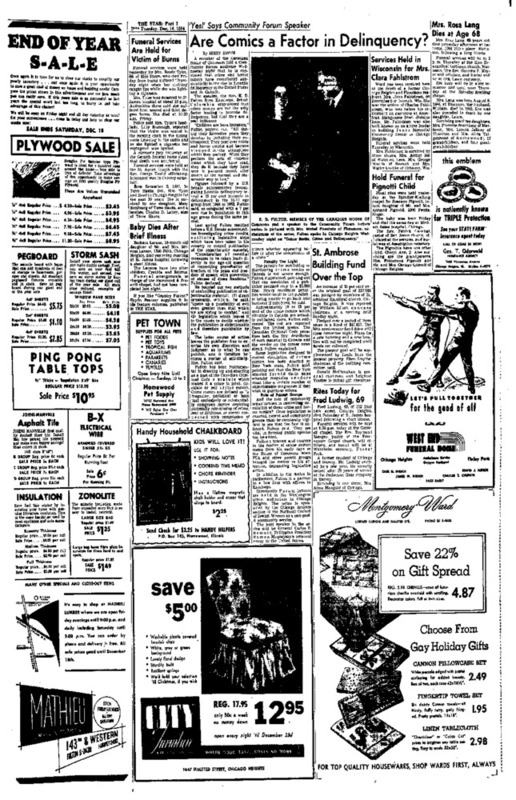 On June 8, 1948, he asked then Minister of Justice and Attourney General, James Lorimer Ilslay if the Criminal Code could not be ammended to prohibit the sale and distribution of corrupting comics, citing a case in Montreal, "where a boy twelve years of age beat his [sleeping] mother to death with a baseball bat. . . when being tried, he said he had seen that sort of thing in the comics" (4933). Fulton went on to describe and quote from a story appeaing in an issue of Crime Does Not Pay, about an arsonist who burns down tenement houses, concluding: "That is a fine thing to putbefore a youngster of twelve or so, who perhaps has just struck his first match" (4933). Of note in the description of this imagined child reader is his implied passivity; he has not sought out or chosen to read this comic, but has had it "put before" him. Further, the suggestion that the imagined boy may never have struck a match before - highly implausible in an age when smoking was commonplace - also emphasizes his innocence. Discussion of how to address the perceived problem of comics encouraging young people to acts of violence continued in a few more sessions in June, 1948. In the June June 14th Commons Debates, Minister Ilsley pointed out the obstacles to enacting legislation targeting a specific genre in a specific print medium, and also cited a number of experts in child psychology and in law enforcement who assured him that there was no provable connection between comics reading and youthful criminality. Discussion of the issue and Fulton's proposed ammendment to the Criminal Code stalled, but were revitalized after the Dawson Creek murders in November of 1948 (see section 10). 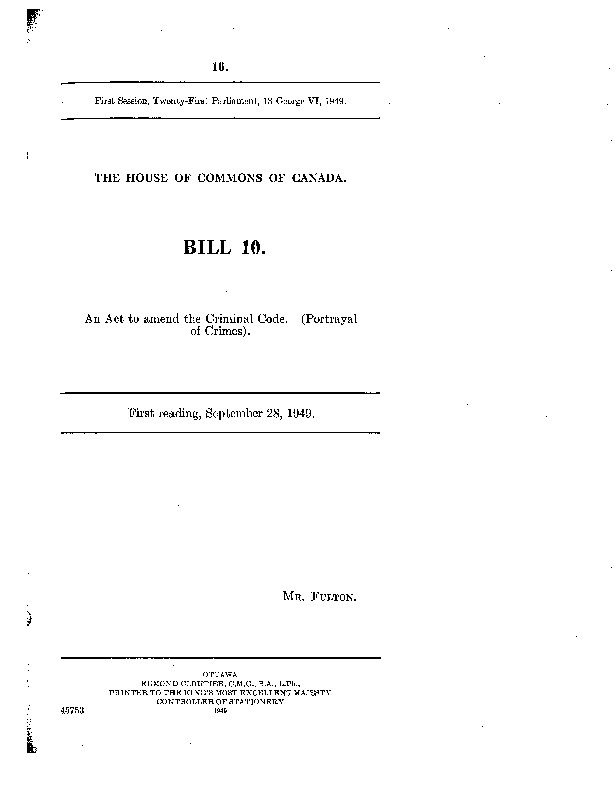 On Sept. 28, 1949, "An Act to Amend the Criminal Code" (Portrayal of Crimes) received its first reading in the House of Commons. The amendment made criminally liable anyone who "prints, published, sells or distributes any magazine, periodical or book which exclusively or substantially comprises matter depicting pictorially the commision of crimes, real or fictitious, thereby tending or likely to induce or influence youthful persons to violate the law or to corrupt the morals of such persons." Bill 10, often referred to as the "Fulton Bill," received its final reading on Dec. 5th, 1949 and was passed into law. 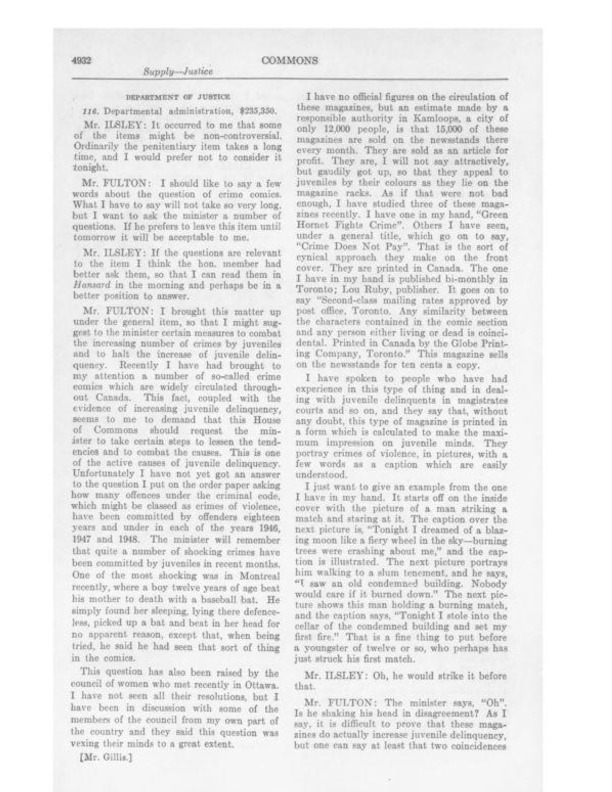 Fulton would later be invited to give testimony at the famous Senate Subcommittee Hearings in New York (see section 9.1). He was also an invited speaker at community events that were becoming increasingly common in the U.S. at the height of anti-comics public sentiment. For example, he was the guest speaker at the Community Forum lecture series held in Chicago in December 1954. Here he asserted to the audience of concerned parents and local authorities that "[c]hildren are born immitators. . . . When they perform te acts of violence they have read, they do it because they have seen it pictured month after month as the normal and reasonable way to live." THe child he and his audience have in mind here is by nature and definition an uncritical and un-selfreflexive consumer, a naive reader whose innocence makes her particularly susceptible to the dangerous messages comics convey. ← 10. Murder in Dawson Creek, B.C.